Sign The Card with Jane Womble (now Gaston) – Regular Working Hunter Champion at Devon in 1972. Photo by Freudy. “We were along for the ride,” Jimmy Lee said about his and Jane Womble’s time with the great Thoroughbred mare, Sign The Card. Sign The Card was bred in South Carolina by Joe Bates and foaled in 1965. She was by Double Hitch (by Double Jay), out of Princess Ala (by Royal Prince). Nora Cooke, of Charlotte, North Carolina, bought the dark bay filly early in her three-year-old year, already broken and going. It was in June of 1968 that Jimmy Lee saw Nora’s son Billy riding the three-year-old around the show at Norfolk, Virginia. As soon as Jimmy saw her, he bought her and took her back to his Belcort Farm at Ingleside in Charlottesville. Jane Womble (now Gaston) was showing in her last Junior year in 1968. She was a great rider who dominated the Pony and Junior divisions on ponies and horses from Belcort that were trained by Jimmy Lee. When Jane aged out of the Juniors, she got her Amateur card and bought the 4-year-old filly that was called “Mary”. The name came from the song “Proud Mary”. Jimmy Lee said that he and Jane liked the song and the name just fit the 15.2 ½ up-and-coming star of the hunter ring. In the Winter of ‘68 – ‘69, Jimmy shipped the Belcort horses (including Mary) to Southern Pines for training in the warmer weather and sand footing. Many of the top professionals of the day wintered there. The Belcort horses were stabled at Nancy Sweet-Escott’s Tremont Farm, along with the horses of Rodney Jenkins, Delmar Twyman, and Joey Darby. One day, Jane was schooling Mary over a big oxer that was four feet in height. Rodney Jenkins was standing on the rail watching. 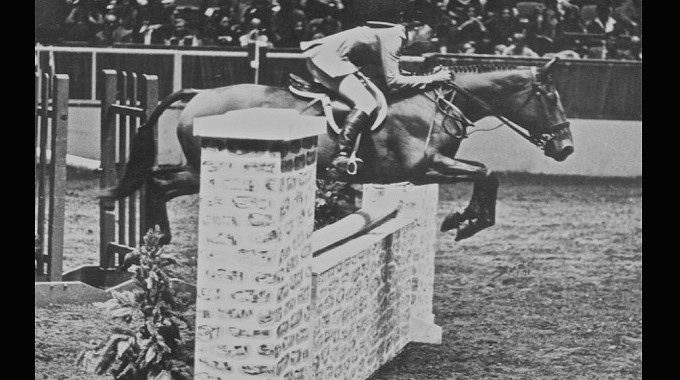 When the four-year-old jumped out of her skin over the big oxer, Rodney said “Man, they can sign the card on that one” (meaning the judges could sign their judge’s cards because the mare had won the imaginary class). There the name was born. From then on, the filly that was nicknamed “Mary” was “Sign The Card” at horse shows. Sign The Card with Jane Womble (now Gaston) – Regular Working Hunter Champion at Chagrin in 1972. Photo by George Axt. 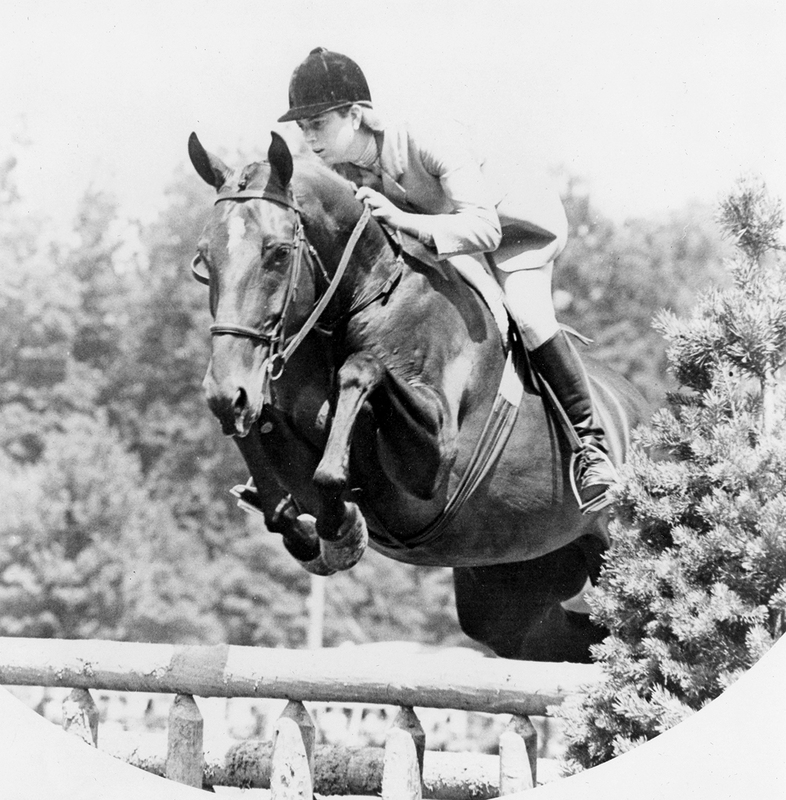 When the Spring of 1969 rolled around and the A shows started in Virginia, Sign The Card and Jane dominated the Amateur Owner Hunter division and won more than their share in the very competitive 1st Year Green Working Hunters at major shows throughout the East Coast including Devon, Harrisburg, Washington, and the Garden. At year’s end, they were American Horse Show Association Horse Of The Year in the Amateur Owner Hunters and Virginia Horse Show Association year-end champions in both the Amateur Owners and the Green Working. 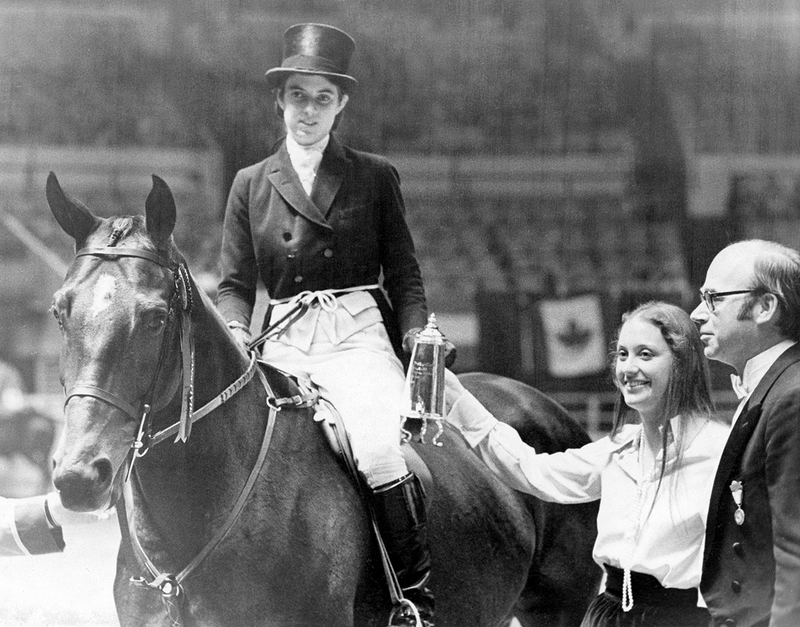 After Jane’s many years of winning all over the country on many horses and ponies, Sign The Card’s AHSA HOTY, in 1968, was the first national title for Jane Womble. It was just the beginning of many. Sign The Card’s dominance continued in 1970 when she ended the year as AHSA Horse Of The Year in both the Amateur Owner Hunters and the 2nd Year Green Working Hunters, as well as winning the Page Lewis Jennings Trophy for being Grand Champion Hunter of the AHSA. They were also VHSA year-end champion in the same divisions. Tragedy struck in the Spring of 1971 when Sign The Card broke her splint bone in a paddock accident. She did not like being turned out and would run from side to side. It is suspected that is how she broke the bone. 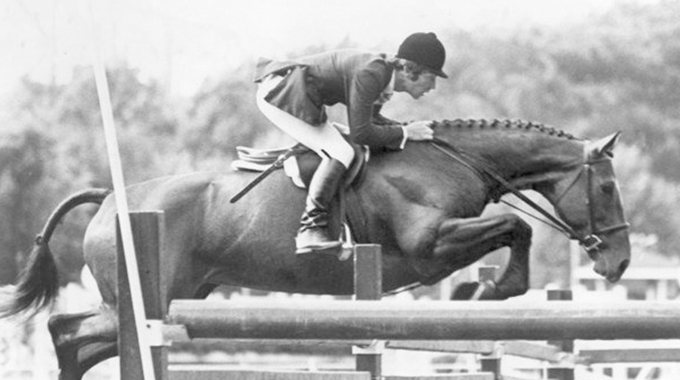 After surgery to remove the broken splint bone, Mary was laid up for the rest of 1971 but she returned to the show ring with a vengeance starting in Florida in the Winter of 1972 where she won the first-ever Hunter Classic in the United States (the precursor to today’s Hunter Derbies). Sign The Card showed in five Hunter Classics and won all of them. Now showing in both the Amateur Owner and Working Hunters, Jane and her superstar mare continued their supremacy. Once again, when year-end awards were presented, the pair were AHSA Amateur Owner Hunter HOTY as well as Working Hunter HOTY and once again won the Page Lewis Jennings Trophy for Grand Champion Hunter of the AHSA. 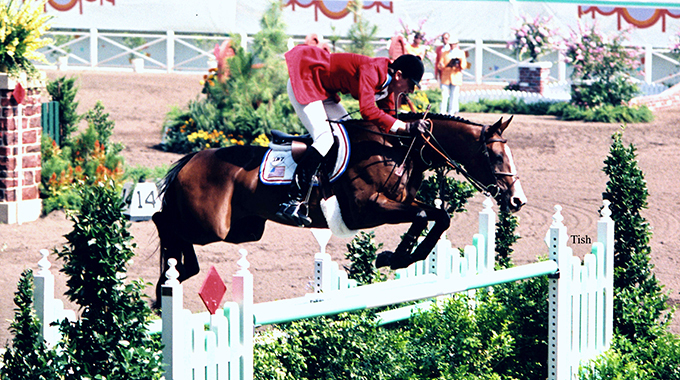 Sign The Card with Jane Womble (now Gaston) – Regular Working Hunter Champion at The National Horse Show in 1972. Photo by George Axt. To watch Sign The Card, with Jane Womble riding, was like watching magic happen right before your eyes. Jane never missed a distance and Mary never jumped a bad jump. It was a beautiful thing to see. 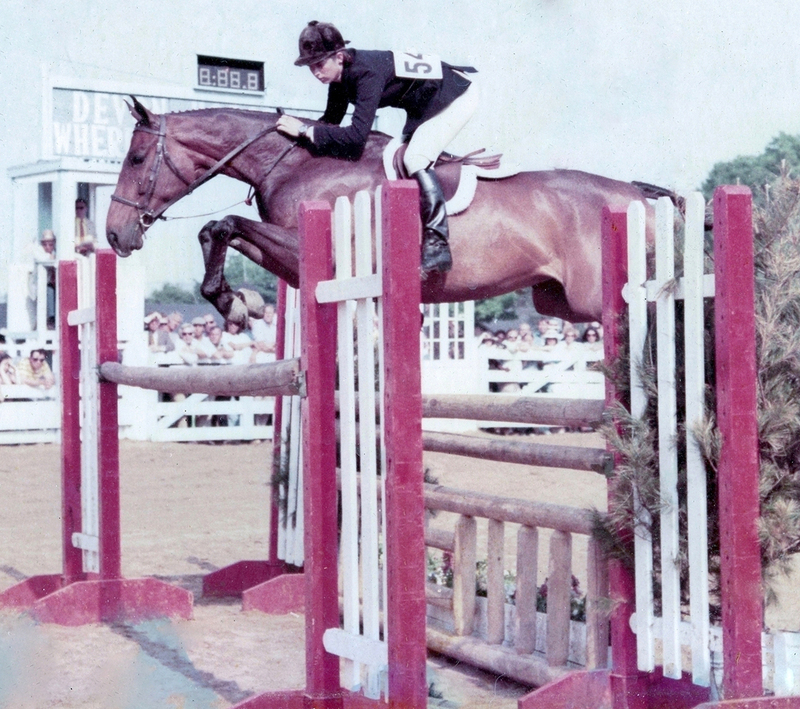 After the 1972 show year ended, Jane left Belcort to ride for Winter Place Farm (where she helped start Jet Run’s show career) and then went to Europe for a year to ride jumpers with Nelson Pessoa. Sign The Card had three foals – In The Cards (by Winged T – winner of the VHSA Futurity, but then got hurt and never showed), First And Goal (by Sir Thomson – sold to Jack Stedding and showed with success), and her last foal, The Winning Card (by Grand Prospect – foaled in 1986). With Sheila Motley aboard, The Winning Card was AHSA Grand Junior Hunter in 1994. Gravestone that Jimmy Lee had made for Sign The Card’s grave at his Belcort Farm in Keswick, VA. In 1975, Jimmy Lee bought The Annex in Keswick, VA (previously owned by Tom Lavery) and renamed it Belcort Farm. Over the years, many great champions have come from that one farm. It is there that Sign The Card lived out her days. She passed away in 1997 and is buried at Belcort. 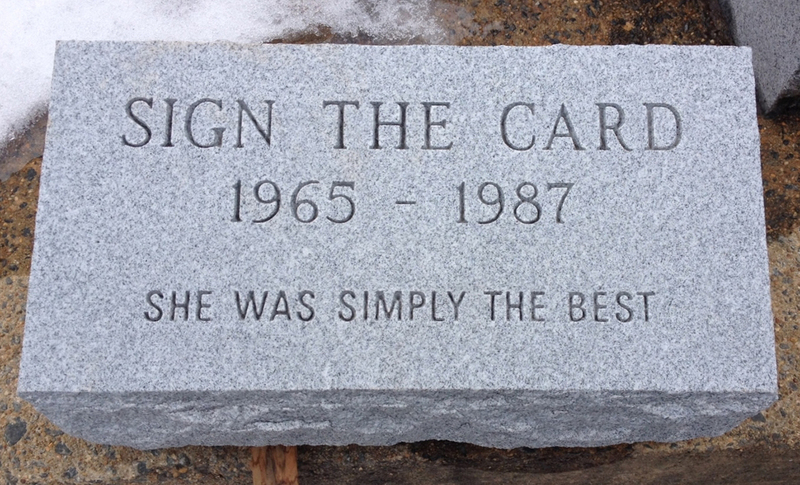 The gravestone that Jimmy had made and placed on her grave reads “Sign The Card – 1965-1967 – She Was Simply The Best”. Sign The Card has been inducted into the National Show Hunter Hall Of Fame and the Virginia Horse Shows Association Hall Of Fame. A truly wonderful and amazing horse! Thank you for writing such a lovely article and history of her life. So glad to hear you enjoyed this article. We did too! Thank you. I’m glad that you both enjoyed the article. She was an amazing mare! I too fell in Love with Sign The Card the very 1st day we met….Jan. ’71 in Boca Raton at the Butts’ Farm, by St. Andrews School, where Jane Gaston & Jimmy Lee’s Belcort Farm were wintered. What a amazing day, meeting Brock the Wonder dog, Pup the beautiful Doberman, Ms. Mary, Perfect Stranger, Jane Womble Gaston, the VB seat, hands & eye to this day that I’ve ever seen, Walker J. Lee Jr. who didn’t know what he was getting into, took this lost soul, became my Mentor, my Friend, on & off over 4+ years tried to educate, lead, nourish, experience, guide me in the direction needed to become a better person/Man. I’m forever thankful to Jane Gaston, to be up close, seeing & learning from the top; Jimmy Lee for giving me just enough rope so I couldn’t hang or drown myself; to both for instilling, actions always speak louder than words. It allowed me to meet someone that’s got a place in my heart always, my girlfriend Marianne Taylor; luckily I haven’t messed that friendship up, not to say, unknowingly as a selfish male I need a white cane w/a red tip. Glad to hear you liked the article, thank you for sharing your story! Thank you, Doug. That was truly a beautifully written remembrance of the past.